Reports suggest that today there are between 1.2 to 2.6 million legal medical marijuana users in the U.S. But as we know, there is great controversy about medical marijuana as a “legitimate” medical intervention due to its history as an illegal substance and the lack of a large body of clinical trial evidence. And yet, according to Pamela Hadfield, co-founder of HelloMD, cannabis is actually one of the single biggest healthcare disruptors out there today. It is not only becoming increasingly serious business, but it is being taken seriously as a viable form of medicine in many quarters, even it though it remains somewhat marginalized in some quarters. Pamela Hadfield has, by many measures, had a traditional path through the tech world. She has been a successful pioneer in 3D animation, virtual reality and user experience all the way back to the early 1990’s. She and her HelloMD co-founder, husband Mark Hadfield, have been part of numerous tech successes and started this company as a continuation of that effort, this time in the telemedicine area. But along the way, they realized the real opportunity was not telemedicine per se, but the legitimization of medical marijuana and the ability to serve patients who had found no other solutions to their medical challenges. A controversial topic to be sure, but one we are not afraid to tackle here on Tech Tonics! 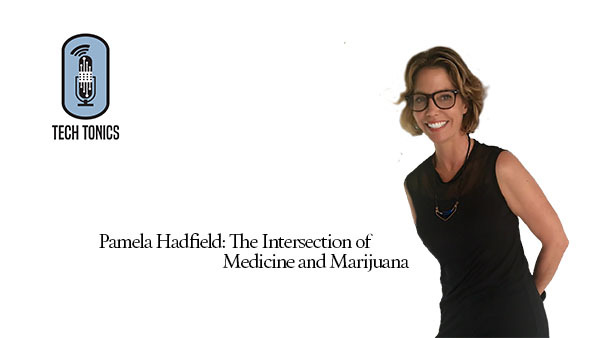 In this episode, Pamela talks about how the cannabis industry is changing medicine and, interestingly, how working in this field can affect friendships and acceptance in the entrepreneurial community, not to mention what you tell your children at the dinner table. We’re grateful to our sponsor, AARP Market Innovation, for supporting this episode of Tech Tonics. AARP Market Innovation, which works to spark innovation in the market that will benefit the quality of life for people over 50.